The most famous volcano has been continuously erupting since 1967, is consisting of seven active peaks extending over an area of 2350 km2, and rising to 1501 meter. 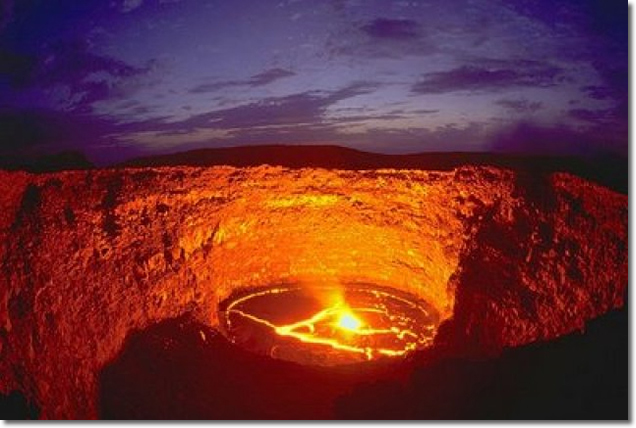 Erta Ale, with long chain of extinct volcanoes is located in Afar National Regional state, northeast of the country close to the Dallol/Denakil depression. Overland cruise into this harsh, but outstanding world is something every one can handle and will not ever forget throughout his/her life time, and it’s best to visit during the relatively coolest time between December – February. There was a major eruption on 25 September 2005 which killed 250 head of livestock and forced thousands of nearby residents to flee. There was further lava flow in August 2007, forcing the evacuation of hundreds and leaving two missing. An eruption on 4 November 2008 was reported by scientists at Addis Ababa University.Another eruption was reported in January 2017.